The corrosion is responsible of enormous economic damage in all nations around the world in direct way as well as indirect way. The direct costs include the equipment substitution and the application of corrosive prevention method (ex. Application method of cathodic protection, recovering and many others methods); while the indirect cost are associated with the product losses, plant shutdowns, operation capacity reduction and failures of components and equipment's. It is important to mention that in the previous description is not considered other costs, which are associated with the related corrosion failures. Losses as: those produced to the personnel on their job places, environmental damages at the closer communities to those working places producers of discharges or leak, the real and most critical cost is the production shutdown generated by inopportune failures. Some of this implementation of inspection programs and corrosion analysis applied properly. The corrosion is a serious problem that it is not been evaluated in all its extension. Some reports has estimated that the economic losses produced by the corrosion problems in the industry race the amount of 70 billions of pesos per year. The corrosion presence is detectable after the obvious deterioration signs existing in the equipment, in that way the corrosion detection is of vital importance but all over the prevention analysis. The technical of the non destructive testing is technical that offers a great potential of corrosion detection. Most of the test methods can be utilized; as example, the visual inspection, technical that has been used extendedly for a long time for these purposes. When the surfaces are accessible, directly or indirectly with special equipment as boroscope or video techniques. A conventional ultrasound instrument has been utilized on the last 30 or 40 years to verify the critical components integrity in the industrial plant. An important application of the ultrasound has been the thickness measurement in order to detect and monitory in a simple way the thickness used to perform the corrosion and pitting analysis. Due to the technological advances a lot of the actual innovated technical is applied in this field, hi-tech thickness measurement instruments has been developed to inform more exactly and truly the engineering materials used on the corrosion industry. During the thickness measurement using the ultrasound technical, hi-frequency energy waves (generally between frequency of 0.2 to 10 MHz) are sent though the utilized material, a crystal piezo-electric called transducer, which is excited by the generated voltage from the ultrasound instrument. The ultrasound instrument is composed by: main source, pulser, receiver, clock and a tube for cathodic rays (actually liquid crystal, electro luminescent source, etc.). The ultrasound energy is spread through the material up to arrive to opposite surface, on which the energy is reflected to the origin surface. 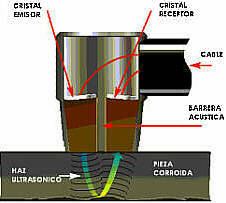 Fig 1: Construction typical of transducer dual which is used in corrosion applications. The transducer detects the pulsation on the rear wall when this arrives to the surface and convert it on voltage (the pulsation continues reflecting partially between the material walls up to its attenuate, it means, the state in which it can no be measured). The time quantity between the reception of two successive signals on the rear wall, is the quantity of required time by the ultrasound impulse to run the material thickness two times. The time space is directly proportional to the quantity time required for a run through the material. Therefore if the sound velocity is constant in a homogeneous material the time quantity between the reception of two signals in the rear wall is directly proportional to the material thickness. The clock circuit will measure the time period on the electronic equipment and the value will aplicated to the velocity equation that is equal to the distance between time. Because the instrument takes the time and the propagating velocity is knew and constant then the time value will be converted to a distance and will be presented in the instrument screen as material thickness. The database gives the storage capacity and the continues monitoring as well as the data record and correction. The interface of data acquisition and the ultrasound system together with the database give to the user the analysis capacity through the interface software designed by the computer which process, analyze and present the report of the requested information on the corrosion analysis and the estimated remaining life. All thickness reads and data are not, by themselves, the information needed to determine adequately the status of internal corrosion in a tank, pipeline or in a vessel. This data should be processed, analyzed and recorded adequately. Temperature correction according to ASTM E-797. UltralogAssist® (Data thickness management) operates connecting formulations of the main manufacturing codes and designs with the specifications of the materials used during the construction and utilizing the operation variable conditions such as: operation temperature and operation pressure. This system compensates the variability of temperature according to the establishment on ASTM E-797 in which is established that in each 50°C of temperature increase on the material this increase 1% of real thickness and is automatically documented in the inspection report that will be utilized during the velocity corrosion calculation and the maximum operation pressure allowed. Results on mm or in/per year. Result is obtained in years or year fraction. Fig 4: every calculation is done according with API 570 code. One of the most important value which have the major utility during the corrosion analysis is the retirement estimated date for the inspected equipment, and this data is a complement of a data group in which UltralogAssist® calculate and document complying with all corrosion evaluation requirements recommended in the document API 570. The information of the estimated retirement date for pipe, tank or boiler is a great utility tool reducing the risk due to the correct planning for future inspections as well as the planning of maintenance activities reducing in this manner a lot of operation failures. This calculation has been developed utilizing the following formulation. In UltralogAssist® (Data thickness management) all estimations of retirement date, estimated useful life and corrosion velocity are obtained considering the calculated data with the formulation e-min (minimum thickness of pressure) calculated according with the applicable code for pipe, tank or boiler. The system offer also the facility to present the utilized formulation for each calculation performed. The system permits to the user the performance of operation simulations according to the thickness readers obtained from each point. This offers to the inspector a simulations for operations and services to grant the best operation for the equipment under inspection and analysis. Fig 5: the system will show the formula according with the applicable code. UltralogAssist® has been a great help for the administration, planning and program of ultrasound inspection, first due to the activities control module in which automatically are recorded the calculated dates for the nearest inspection, obtained and documented in the analysis and pressure reports as well as in the qualified personnel sections, measurement instruments and valves. Fig 7: Analysis report with show the remaining life and next inspection date. To realize the verification date of the thickness measurement instrument utilized during the inspections. To realize the planning of maintenance and inspection of the valves into the pipe circuit or tank. To program the date for qualification and certification for the personnel of non destructive testing. Administrate and control of isometrics associated to an inspection due to the compatibility with the principal programs utilized for these purposes such as AutoCAD R14, Microstation, Freelance Graphics, Etc. Provide a corrosion pendant graphic in which is compared the inspection date vs. retirement e-min. Allowance to realize changes on the circuit drawings from the associated equipment without alteration of evaluated results. To control the file of each inspector of non destructive testing and the print out as control file. The system provides to the users a graphic of the surface map in which appear a superficial view of the status of each section under analysis of corrosion founded that is automatically generated. UltralogAssist® includes a configuration module for the inspection analysis that allows the operators the possibility to personalized the method for corrosion analysis according with the specific requirements of their installations. Into a corrosion-founded analysis has been a great help the surface graphics that the system can generate due to the easy interpretation and the relation with the real status of the corroded area. This graphic as well as all reports that the system can generate has the possibility to be exported to the most commercial programs such as Word, Excel, HTLM format for Internet and the general format with RTF extension. The Mexican experience utilizing this type of computer software has produced favorable and profitability results through the important reduction of the inspection cost as well as operation and maintenance cost around the Country. UltralogAssist® has been the first Mexican attempt for the standardization of the inspection methods and the corrosion analysis with the important reduction in the risk of ecological damages, human risk and the cost reduction for the production shutdown generated by chemical or petrochemical plants.